• the position of state aid debt in bankruptcy proceedings. No serious academic contribution to the present debate on the reform of state aid law can afford to ignore this book. As a unique and thorough overview of state-of-the-art knowledge on national law and practice on EU State aid matters, this compendium will be of inestimable value to practitioners involved in representing interests of beneficiaries and competitors before national authorities or national courts, or before the European Commission or European Courts. The analyses will also be welcomed by authorities granting state aid, including public enterprises. Contents: Introduction. General Report on State Aid; P.F. Nemitz. 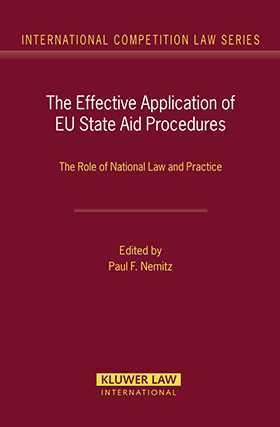 State Aid—The Effective Application of EU State Aid Procedures: From a Plan to Grant Aid to the Recovery of Illegal Aid—The Role of National Law and Practice; F.-E. González Díaz. Austria; A. Lengauer. Belgium; J. Derenne, C. Guirado. Croatia; M. Liszt, S. Petrović. Cyprus; C. Lycourgos. Denmark; P. Biering, K. Lundgaard Hansen. Finland; H. Merikalla. France; A. Müller-Rappard, J. Bousin, J. Derenne. Germany; J. Kühling. Greece; A. Metaxas. Ireland; A.M. Collins, D. Collins. Italy; C. Schepisi. Latvia; E. Šķibele, A. Vītols. The Netherlands; P.C. Adriaanse. Norway; E. Hjelmeng. Poland; S. Dudzik. Portugal; M. Porto, J. Nogueira de Almeida. Spain; J L. Buendia Sierra. Sweden; I. Simonsson. Switzerland; P. Këllezi. United Kingdom; A. Sutton.